It’s June and definitely Strawberry season! 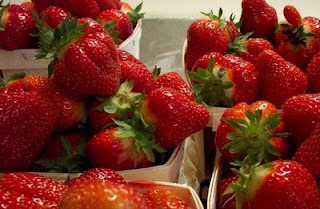 Hmm, perhaps I should clarify this a bit – the end of June is approaching and the local fresh Strawberry season will be coming to a close soon. 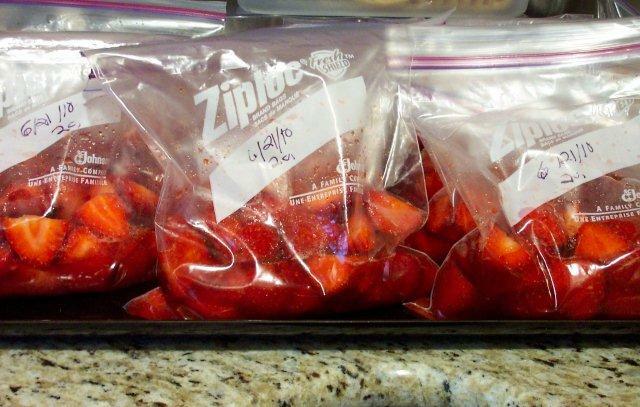 Every year, as far back as I can remember, I have prepared and then placed fresh Strawberries in the freezer. While growing up it was a tradition of summer. My sister & I would help our mom with the Strawberries detail. Then, came the Blueberries. 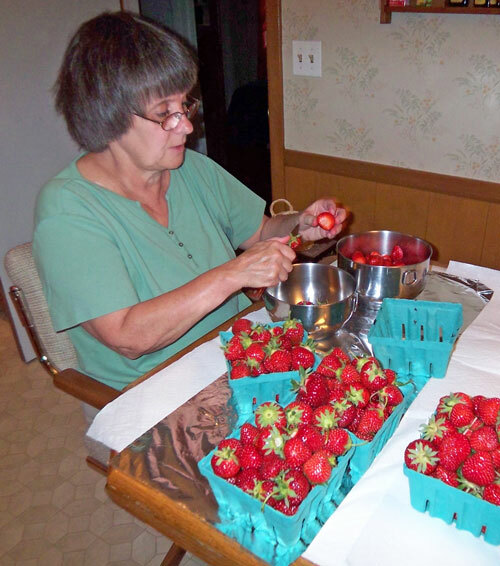 Knowing how much my family enjoys Strawberries on Oatmeal Pancakes, ice cream, or in fruit salads throughout the year, Meadowbrook Farm in East Longmeadow was my destination on Monday morning. An overflowing 8-quart container plus two additional quarts were purchased. Most of these delicious, juicy, fragrant, red berries were placed in Ziploc Freezer Bags. However, first the tops were removed. The berries were double washed in cold water, sliced and then packaged and dated. Today was the day for Strawberry Freezer Jam. 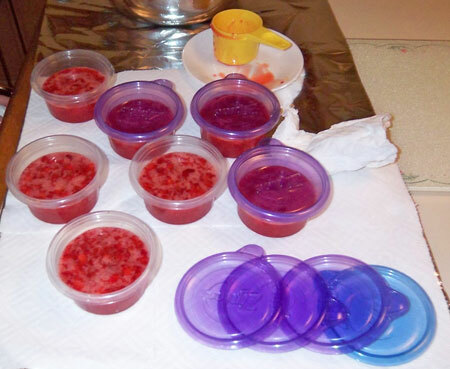 Certo, Lemon Juice, Sugar and 1-cup freezer containers are also needed. Freezer Jam is great! The directions are located inside a box of Certo. After getting the 2 batches completed, the containers will sit undisturbed for 24 hours on my Dining Room table. Tomorrow after the 24 hours pass, they will be placed in the freezer. June has been a very busy month, but the desired trip to Meadowbrook Farm for Strawberries was made. Nothing compares to fresh local fruit or produce! Now, I will also be able to bake Strawberry Banana Bread, again! Do you purchase local fresh fruit? Do you make Freezer Jam? In the past I’ve mentioned that Bananas are not a favorite fruit of mine. Well, that certainly is in the past. Yes, every day I do savor the sweet taste of a potassium filled Banana, because it is healthy. But somehow there usually is one remaining Banana in our fruit bowl that is spotted. That is a “Baking Banana”. The Blueberry Banana Bread is a big hit with my family. Now, Strawberry season is here, but in our freezer there was one last remaining Ziploc Freezer bag containing halved Strawberries. And, lo and behold there were three overripe Bananas waiting! You guessed it! I substituted the defrosted Strawberries that were cut into ¼’s and into the batter they went. 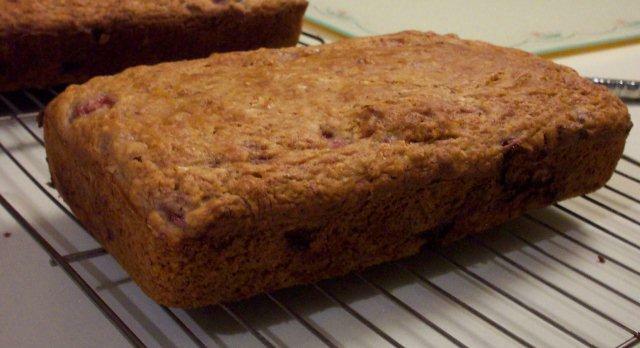 Strawberry Banana Bread sure tastes mighty fine! Do you enjoy the combination of Strawberries and Bananas? Yummy! 1. Combine all dry ingredients in large bowl and stir well. 2. Mash Bananas in small bowl. Add cut Strawberries to small bowl. 3. Beat Egg and add with liquid ingredients to Flour mixture. 5. Stir all until combined. 6. Spray 2 Bread Pans (8 and ½ “ or 9”) with PAM and pour in batter, evenly. 7. Bake 55 – 60 Minutes or until cake tester (toothpick) comes out clean. 8. Place pans on wire rack. Cool in pans 10 minutes. 9. Remove from pans and cool. While these breads were baking, the aroma in my kitchen floated out to our Family Room. 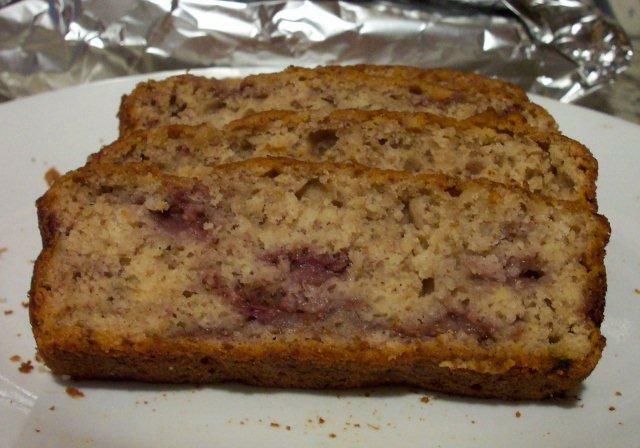 The combination of Strawberries, Cinnamon, Nutmeg and Bananas smelled so good! Yes, I did say Bananas. I will surely be baking these again. Tonight, there are a few slices of this scrumptious treat left. The second wrapped bread will not last too long with Father’s Day tomorrow. To all the Dads – Happy Father’s Day!!! Ever since my DH & I enjoyed the absolutely delicious Swordfish Dinner while dining at a quaint restaurant in Maine many years ago, Grilled Swordfish has been one of our favorites. This week the seafood dept. in our grocery store has fresh wild Swordfish. No fancy topping nor sauce is needed. A coating of Olive Oil and Paprika before grilling is simple and is the best! Yum! Tonight the grill was heated. Dinner took about 15 minutes to prepare. Microwaved “Baked” Potatoes and a healthy veggie salad were ready quickly. Grilled fish is so good! It is one of the great foods of summer! 1. Pour about 2 TBS. of Olive Oil on a large dish. 3. Rinse the Swordfish Steak under cold running water. 4. Then, place it on the Olive Oil/Paprika. 5. Turn the Swordfish over to coat the other side. 6. Place fish on the hot grill. 7. The fish is turned over one time during the grilling process. 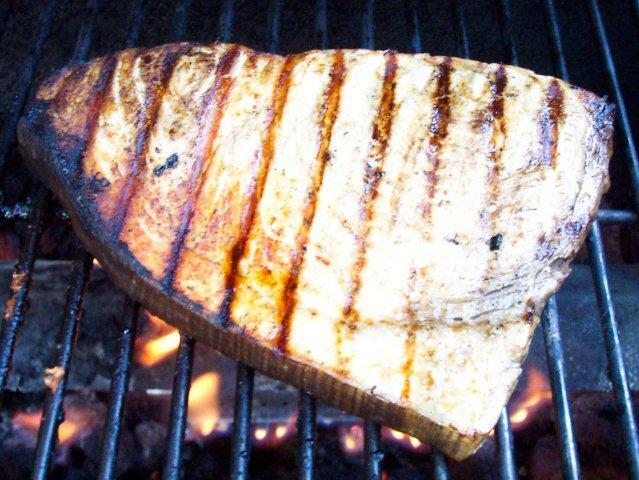 ** The amount of needed grilling time depends on the size of the piece of Swordfish and the grill. A 1 lb. piece requires about 5 minutes and 30 seconds on each side. **We do not use a Grilling Basket while grilling Swordfish. Tomorrow’s dinner will be prepared inside. Raindrops are predicted. It’s great to use the Grill whenever possible! A simple box of corn muffin mix can make a very yummy breakfast! Yes, the mix can be combined with Egg Whites and Soy Milk for great tasting Corn Muffins. Better yet, using the same brand of corn muffin mix (Jiffy) that my mom used when I was growing up some mighty fine Banana Cornmeal Pancakes were on our Breakfast table this morning! Yes, I did say Banana. In the past I’ve shared that Bananas are not my favorite fruit, but I try to eat one every day. It is that Potassium thing - trying to stay healthy. :) There are always at least three in our fruit bowl! 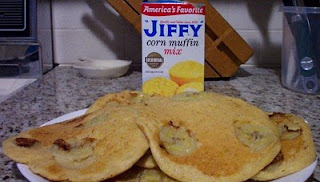 On the side of the Jiffy Corn Muffin mix box there are directions for the Pancake version of my “comfort food”. I used Egg Whites, Soy Milk, Olive Oil and added ¼ tsp. Cinnamon to the batter. This morning my red griddle was heating up and two Bananas were thinly sliced. Three or four slices were placed on each pancake while it was cooking. Quickly and without much fuss Breakfast was ready! Extras? Oh, yes! After they cooled they were packaged and stored in the freezer. 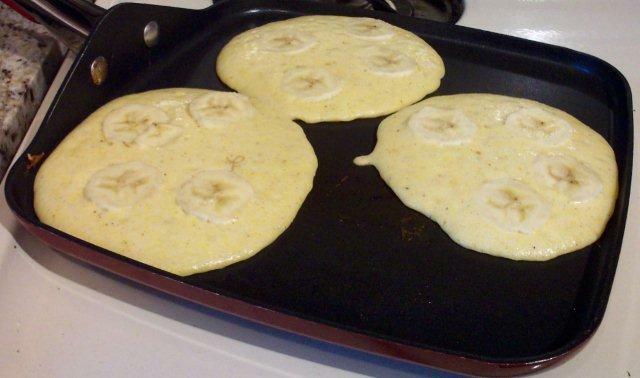 Do you add Bananas to Pancakes?